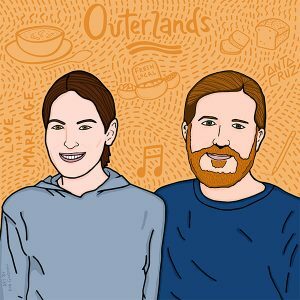 Lana Porcello and Dave Muller are the owners and operators of Outerlands, one of my favorite restaurants in San Francisco, renowned city- and countrywide for its sophisticated home-style California fare. In the latest episode of Making Ways, I chat with the married duo about their path to opening the restaurant, their backgrounds as artists and musicians, Dave’s bread making, and the advice they give to friends about pursing any creative or business endeavor. Lana and Dave didn’t have a master plan to open a restaurant one day, but they followed a feeling for the kind of environment they wanted to create, the types of conversations they wanted to foster, and the reactions they wanted from their guests. Lana explains, “I would always visualize this space with people talking and laughing around me and everybody having a great time. And that was really what I wanted. I wanted a community.” Read on for more insights from Dave and Lana. And listen to the full episode of Making Ways right here. I hope that their approach to formulating and pursuing a creative project or business serves you well as you plot your own journey. With a successful, thriving business in San Francisco’s Outer Sunset neighborhood, Lana and Dave are often asked for advice by people pursing a creative business venture. Lana always starts by turning the tables and asking them about their goals, which usually means going deeper than just what the final product will be. She explains, “Sometimes a goal doesn’t even look like a goal. It looks like: ‘I want to feel a certain way’ or ‘I want to change this aspect of my life.’” Depending on what you are trying to achieve in your life, both the final product and your path toward that pursuit will look very different. Lana suggests a momentary visit to a future feeling. “I think that’s where visualization is so critical, because I definitely believe that if you can be in the moment that you want later, just for a second,. . .then you are giving yourself up to that time later. And by doing that you are kind of letting go of how it’s going to look to get there.” Whether you are a spiritual person or not, the takeaway is clear––understand what’s at the heart of what you are trying to achieve. And one way to get there is to try to conceptualize what you hope to feel after accomplishing your work in the future. After all, there’s no use going through the motions of achieving something if it’s not going to bring you fulfillment and satisfaction. So use your imagination to help connect the dots. Lana did just that when she and Dave were envisioning the space that would eventually become Outerlands. Their unconscious goal was actually a desire to create a community. Once they realized this aim, their ideas led them to starting a restaurant. Lana explains, “I think. . .having this more abstract goal. . .allowed us to just go with what was presented to us and not be attached to ‘oh, I need to do it this way, or this is how you have to do it.’” And ultimately by following their own process, Lana and Dave established a different kind of restaurant, one more in line with their vision, with the feel of community at the heart of all their decisions. So try firing up your future mind and—just for a moment—visit that place, harness that feeling, and work up your goals and plans from there. It’s a good lesson in business as in life, so if your structure isn’t thrust upon you by nature or operating framework, consider setting yourself up for success (and a ton of hard work) by developing a structure that won’t bend to your schedule and instead locks you in to deliver every day, every year. The lessons Lana and Dave shared during our interview for Making Ways certainly left an impression on me, and I hope the episode and the takeaways above help you find the right recipe to establish and see your pursuits through to grand completion. You can visit Outerlands at 4001 Judah Street and check out www.OuterlandsSF.com to learn more. Be sure to listen to the new episode at MakingWays.co. Please reach out to me with questions and feedback on Twitter at @therobgoodman and @making_ways. And here’s to your future moment of fulfillment and success.